Alloreactive T cell precursor frequency was measured in vivo using fluorescent dye labeling in combination with novel models based on lymphocyte activation and recovery. CFSE-labeled C57BL/6 (H-2b) spleen and lymph node cells were adoptively transferred to C57BL/6×DBA F1 (H-2b/d) recipients, a parent→F1 MHC mismatch in which only donor cells respond. Recipients were sacrificed at serial time points to assess engraftment efficiency, and the extent of donor cell activation and proliferation. These data were used to calculate alloreactive T cell frequencies that varied 30-fold (0.71 ± 0.31% to 21.05 ± 3.62%), depending upon whether it was assumed that all donor cells injected became established and were capable of responding, or that only those present at later time points (24–72 h) were available to respond. By measuring the number of cells established in the recipient 24 h after transfer, before proliferation, we calculated an in vivo alloreactive frequency of ∼7%. Using CD69 expression at 48 h to quantify activation, we found that 40–50% of the alloactivated CD4+ donor T cells do not divide. Studies of cotransferred congenic and allogeneic cells demonstrated that bystander proliferation does not occur. We conclude that accurate calculations of alloreactive precursor frequency must account for both proliferation and cell engraftment. When this is done, a high percentage of alloreactive T cells exists across an MHC mismatch, but not all alloreactive cells proliferate in vivo. Bystander proliferation is negligible, revealing exquisite specificity to the alloresponse. These data provide a novel approach to quantify alloreactive T cell responses during specific immunomodulatory strategies in vivo. Explaining the rigorous T cell response to alloantigen has been a long-standing challenge in immunology. The percentage of T cells responsive to alloantigen in vitro and in vivo is much higher than the percentage of T cells that respond to foreign peptide Ag, but the magnitude of the difference is controversial. It has been traditionally stated that the frequency of peripheral T cells that recognize alloantigen is between 1 and 10% (1, 2, 3, 4). However, depending on the species studied and the method of analysis employed, in some systems the alloreactive precursor T cell frequency has been reported to be <1/10,000 (5, 6, 7). The broad range of estimated alloreactive T cell precursor frequencies results in part from the lack of standard and reliable experimental methods to address this problem. One commonly employed method is limiting dilution analysis (LDA),4 a technique that uses the statistical probability of cells cultured individually to grow or to develop effector function (5, 8, 9, 10, 11, 12, 13). However, in the case of CD8+ T cells, the number of precursor T cells detected by LDA has been shown to be 50–500 times lower than that detected by other methods, such as MHC tetramer staining (14). Whether or not similar limitations apply to the LDA technique in the case of CD4+ T cells has not been determined, due to the difficulties at present in the development and use of MHC class II tetramers. More recently, enzyme-linked immunospot (ELISPOT) has been used to estimate the alloreactive T cell precursor frequency. This sensitive method of detecting cytokine secretion has yielded precursor frequencies of 1/4,000 to 1/20,000 (15). ELISPOT may also underestimate the true precursor frequency by ignoring alloreactive cells that do not elaborate the particular cytokine detected at the time the assay is performed. In addition, ELISPOT cannot distinguish cells that are activated through their TCR binding to Ag plus MHC from cells that do not bind alloantigen, but respond to soluble factors secreted by neighboring cells. To study alloreactive T cells under more physiologic conditions, and consequently better estimate the precursor frequency, we used the fluorescent cytoplasmic dye CFSE in combination with flow cytometry. This dye’s property of distributing equally to daughter cells upon division has enabled it to become a highly useful tool to study lymphocyte division kinetics and differentiation in a variety of in vitro and in vivo systems (16, 17). We report in this study quantitative methods to estimate the alloreactive T cell frequency in an in vivo system based on CFSE dilution profiles. We also quantitatively define the in vivo activation of adoptively transferred allogeneic T cells as a function of division cycle, and use this to give a direct evaluation of allogeneic bystander activation in vivo. Female C57BL/6 (H-2b), C57BL/6 Thy-1.1 (C57BL/6J-Igha-Thy-1a-Gpi1a, H-2b), bm12 (B6.C-H2bm12/KhEg), and C57BL6×DBA F1/J (B6D2F1, H-2b/d) mice were purchased from The Jackson Laboratory (Bar Harbor, ME). BALB/c Thy-1.1 mice were provided by R. Dutton (Saranac, NY), and anti-bm12 TCR-transgenic B6 mice (anti-bm12) were previously described (18). The transgenic TCR expressed by these mice uses Vα2 and Vβ8, and >95% of peripheral T cells are Vα2+Vβ8+ (data not shown). All mice were housed in a pathogen-free facility and were used at age 8–16 wk. Spleen and lymph nodes from donor mice were harvested, and single cell suspensions were prepared and labeled with CFSE (Molecular Probes, Eugene, OR), as previously described (16). Fluorochrome-labeled mAbs against CD4, CD8, CD44, CD45RB, CD62L, CD69, Thy-1.1, Thy-1.2, CD16/CD32 (Fc block), and Vβ8, biotin-conjugated Vα2, fluorochrome-labeled streptavidin, and isotype controls were purchased from PharMingen (San Diego, CA). A total of 3–5 × 107 CFSE-labeled C57BL/6 Thy-1.1 splenocytes and lymph node cells were injected i.v. into B6D2F1 mice in a total volume of 0.25 ml sterile PBS. Syngeneic C57BL/6 (Thy-1.2) mice were used as recipients in control experiments. Recipients were sacrificed at 24, 48, or 72 h, and spleen and lymph nodes (superficial inguinal, axillary, lateral axillary, cervical, and paraaortic) were harvested. For studies of bystander activation, CFSE-labeled B6D2F1 splenocytes and lymph node cells (2.5 × 107) were coadoptively transferred with unlabeled C57BL/6 Thy-1.1 splenocytes and lymph node cells (2.5 × 107) into B6D2F1 mice. Recipients were sacrificed at 48 h. For bm12 studies, CFSE-labeled anti-bm12 splenocytes and lymph node cells (5 × 106) were coadoptively transferred with CFSE-labeled bm12 splenocytes and lymph node cells (5 × 106) into bm12 mice. Recipients were sacrificed at 24 h.
MLRs were established in 24-well flat-bottom plates between CFSE-labeled BALB/c-Thy-1.1 spleen and lymph node cells (2.5 × 106/well) and irradiated C57BL/6 (Thy-1.2) splenocytes (7.5 × 106/well). In control experiments, BALB/c-Thy-1.1 splenocytes were used as stimulator cells. Cells were harvested at 24, 48, 72, and 96 h; stained for CD69, CD4, Thy-1.1, and TOPRO-3 (16); and analyzed by flow cytometry. Cells were washed in PBS containing 2% FCS and 0.02% azide at 4°C. Unlabeled Ab against CD16/CD32 (anti-FcRγIII/FcRγII) was used to block FcR binding. Between 1 and 5 × 106 cells were stained with either PE-conjugated anti-Thy-1.1 or -Thy-1.2, PerCP-conjugated anti-CD4, and either biotinylated anti-CD69, -CD44, -CD45RB, or -CD62L, followed by APC-conjugated streptavidin. FITC-conjugated anti-CD4 and PE-conjugated anti-CD8 were used to determine the percentage of T cells in donor splenocytes and lymph node cells. In experiments using CFSE-labeled bm12 and anti-bm12 cells, harvested cells were stained with biotinylated anti-Vα2, PE-conjugated anti-Vβ8, and APC-conjugated anti-Thy-1.2, followed by CyChrome-conjugated streptavidin. Four-color flow cytometry was performed on a FACScalibur (Becton Dickinson Immunocytometry Systems, San Jose, CA), and cells were analyzed using CellQuest acquisition and analysis software. A gate defining lymphocytes by forward and side scatter properties was used in all analyses. Between 0.5 and 2 × 106 total events were collected yielding 1–5 × 103 Thy-1.1 events. In this study, CFSE was used to assess the in vivo proliferative kinetics of parental T cells transferred to an F1 hybrid recipient. C57BL/6 (H-2b) splenocytes and lymph node cells transferred i.v. to B6D2F1 (H-2b/d) recipients are potentially alloreactive against recipient Ags contributed by the nondonor haplotype parent. For these analyses, we used C57BL/6 donors congenic for the Thy-1.1 allele and B6D2F1 recipients that carried the Thy-1.2 allele. Therefore, we were able to use an anti-Thy-1.1 Ab to detect the donor cells harvested from recipient peripheral lymphoid organs after adoptive transfer. A gate defining the CD4 subset was used to distinguish this population (Fig. 1⇓, A and B). Kinetics of alloreactive T cell proliferation in vivo. CFSE-labeled C57BL/6 Thy-1.1 splenocytes and lymph node cells were adoptively transferred into control C57BL/6 Thy-1.2 recipients (A and C, autologous reactions) or B6D2F1 recipients (B, D, and E, allogeneic reactions). Flow cytometry dot plots gated on live lymphocytes harvested from the recipient spleen and lymph nodes are shown in A and B. A region marks the CD4 donor cells. CFSE fluorescence histograms of live Thy-1.1 (donor) cells recovered 24, 48, or 72 h after adoptive transfer are shown below (C, D, and E). The numbers above each histogram (0–8) denote division populations, with the undivided T cells forming the rightmost peak and the T cells that divided eight times residing in the leftmost peak. Cell division began >24 h following adoptive transfer, and by 48 h three rounds of division occurred. Maximal discernible proliferation consisting of eight rounds of cell division was present by 72 h (Fig. 1⇑, D and E). Heterogeneity in the alloreactive proliferative response was seen, as some T cells had divided as many as eight times by 72 h, whereas other donor cells had divided only once or not at all. In contrast, no proliferation was detected when C57BL/6 Thy-1.1 splenocytes and lymph node cells were transferred into syngeneic C57BL/6 Thy-1.2 mice, demonstrating negligible background proliferation in this system (Fig. 1⇑C). Finally, based on the proliferative profile, the majority of the recovered donor cells consisted of the CD4 T cell subset (Fig. 1⇑E). The difference in the total cell counts in Fig. 1⇑D and the CD4 cell counts in Fig. 1⇑E is presumably accounted for by the CD8 T cells. The number of cells within each CFSE fluorescent peak is determined by analysis of the flow-cytometric histogram plots. From the number of events comprising a peak, representing alloreactive daughter cells with identical proliferative history, the number of precursors that divided to generate that population can be extrapolated by dividing by 2n, in which n is the division cycle number (16). For example, if 100 events are counted in the third peak from the right, representing two rounds of cell division (n = 2), the number of precursor alloreactive cells that generated these 100 cells equals 100/22 or 25 cells. Summing the extrapolated precursors for division cycles 1 to n yields the size of the alloreactive precursor pool recovered from the recipient and analyzed by flow cytometry that divided in response to alloantigen (Pdiv). The frequency of alloreactive T cells is expressed as the ratio of two quantities: the number of dividing cells (Pdiv), which makes up the numerator, and the total number of cells (Ptot), comprising the denominator (Fig. 2⇓). Pdiv is relatively straightforward to estimate, as described above. However, Ptot is complex and its estimate has contributed to the limitations and variability of previous attempts to estimate the alloreactive precursor frequency. We used a single method to determine Pdiv in conjunction with three distinct methods to determine Ptot in estimating the alloreactive T cell precursor frequency in vivo. As depicted in Fig. 2⇓, the methods are distinguished by the time point used to determine Ptot: after adoptive transfer at the time of maximal proliferation (method 1), before adoptive transfer (method 2), and after adoptive transfer but before cell division (method 3). Therefore, the value of Ptot determined by each of the three methods described determines the estimated value of the alloreactive T cell frequency. Schematic representation of three quantitative methods to estimate the frequency of alloreactive T cells. We used three methods to calculate the frequency of alloreactive T cells. In each method, the frequency of alloreactive cells is the fraction Pdiv/Ptot (i.e., the cells that divided as a proportion of total cells). Pdiv represents cells that divided in vivo and is calculated by using the 72-h CFSE profile and extrapolating to derive the number of T cells that entered the dividing pool. The identical Pdiv is used in each method. The differences between each method lie entirely in how the value for Ptot is derived. In method 1, Ptot1 is derived by extrapolation from the total number of T cells (divided and undivided) recovered at the peak of clonal expansion. Ptot1 therefore is simply Pdiv plus the number of undivided precursor donor T cells analyzed at 72 h posttransfer. In methods 2 and 3, Ptot is not extrapolated from the postexpansion population, but rather is measured directly. In method 2, the number of T cells used for adoptive transfer (i.e., a direct measurement) is used as the value of Ptot2. In method 3, Ptot3 is calculated from an adoptive transfer performed in parallel, using the number of T cells recovered from the secondary lymphoid tissues immediately before the phase of clonal expansion has begun (24 h posttransfer). In the first method, the frequency of alloreactive T cells is determined solely from the CFSE profile of recovered donor cells at 72 h. The sum of the extrapolated precursors for each division cycle, including the undivided population in which n = 0, determines the size of the donor alloreactive precursor pool (Ptot1). Dividing the number of precursors that responded to alloantigen by proliferating (Pdiv) by Ptot1 yields the responder frequency. The responder frequency has the advantage of being easy to calculate, as it makes no assumptions regarding the fate of the transferred donor cells. The number of donor mononuclear cells transferred to the recipient is not considered in the calculation, and therefore transferred cells that have died or failed to find their niche in the host are not analyzed. However, the responder frequency might overestimate the actual alloreactive T cell frequency, as only the portion of donor cells recovered from the sampled recipient lymphoid organs and then analyzed by flow cytometry forms the number of total potentially alloreactive T cells (Ptot1). This population most likely overrepresents cells that proliferate, as by 72 h a large proportion of the nonalloreactive or nonproliferative alloactivated cells may have died. Method 2 attempts to define the alloreactive T cell precursor pool size as a portion of the total number of donor T cells transferred. In this method, Pdiv is divided by the number of transferred donor T cells (Ptot2), yielding the ratio of Pdiv to Ptot2 we define as the precursor frequency. This approach to estimating Ptot is limited by the fact that by 72 h a portion of the transferred cells will be in recipient sites that we did not sample (liver, lungs, etc. ), thereby excluding their responders from analysis and underestimating the precursor frequency. Furthermore, even in the sites we examined, many cells may not become established due to lack of physical space or functional niches. This also will bias the analysis toward an underestimate. In method 3, we attempt to more accurately define the potentially alloreactive T cell pool by measuring the size of the donor T cell pool 24 h after adoptive transfer, before any proliferation has occurred. The alloreactive T cell frequency is determined by dividing Pdiv by the number of donor T cells recovered at 24 h from a recipient spleen and lymph nodes (Ptot3). We term the resulting number the recovered precursor frequency. Recognizing that not all transferred lymphocytes will have homed to the secondary lymphoid tissues, we reasoned that this method most accurately quantifies the alloreactive T cell frequency, because it is not biased by an abundance of proliferative cells, and it reflects the donor cells that found niches in the lymphoid sites sampled before their onset of proliferation. The responder frequency (method 1) of B6 (H-2b) splenocytes and lymph node cells reacting to H-2d Ags in B6D2F1 hosts (H-2b/d), was 21.05 ± 3.62% and 26.39 ± 3.72% for total T cells and CD4 T cells, respectively (n = 7, Table I⇓). The precursor frequency (method 2) was calculated to be 0.71 ± 0.31% of all donor T cells and 0.58 ± 0.21% of CD4 T cells (n = 7, Table I⇓). The recovered precursor frequency (method 3) was determined to be 6.84 ± 3.90% for all T cells, and 5.71 ± 3.39% for CD4 T cells (n = 3, Table I⇓). Of note, in each experiment Ptot3 was <10% of Ptot2. This low recovery confirmed our suspicions that not all transferred cells would traffic to and engraft in the lymphoid organs that we sampled. Therefore, method 3 may give the most accurate estimate of the alloreactive T cell frequency compared with methods 1 and 2. By each method, the alloreactive T cell frequency was not detectable for the syngeneic control because no proliferation was observed (Fig. 1⇑C). An assumption of method 3 is that among injected cells, the alloreactive cells do not preferentially localize to the recipient spleen and lymph nodes. If they did, method 3 would overestimate the alloreactive T cell precursor frequency. To directly test this, we coadoptively transferred into bm12 recipient mice a 1:1 mixture of CFSE-labeled spleen and lymph node cells from bm12 mice and from TCR-transgenic mice specific for the class II bm12 alloantigen. In this system, 50% of the transferred cells are syngeneic to the host and therefore not reactive and 50% are reactive to recipient alloantigen. After 24 h, the recipients were sacrificed and their spleen and lymph node cells were harvested and analyzed by flow cytometry to assess syngeneic vs allogeneic donor cell recovery in the host secondary lymphoid organs. T cells from anti-bm12 mice are >95% Vα2+Vβ8+, whereas ∼2% of T cells from bm12 mice use this TCRαβ heterodimer (data not shown). For this analysis, allogeneic anti-bm12 T cells were defined as CFSE+ Thy-1.2+ Vα2+Vβ8+ cells, while syngeneic donor bm12 T cells were defined as CFSE+ Thy-1.2+ cells that were Vα2 and/or Vβ8 negative. Because ∼2% of normal bm12 T cells are Vα2+Vβ8+, we adjusted the final values to account for the bm12 cells that bear this TCR heterodimer but are not alloreactive. With this analysis, we found that 42 ± 2.12% (n = 2) of the recovered donor cells were anti-bm12, a value similar to the original 50% proportion transferred. This suggests that alloreactive and nonalloreactive T cells exhibit similar homing to recipient secondary lymphoid organs in this model. Therefore, we believe that our yield-based calculations (methods 1 and 3) are not biased significantly by differential homing. We wished to compare the results of the in vivo quantitative methods with those obtained from an in vitro alloreaction. In vitro MLRs were established between irradiated C57BL/6 Thy-1.2 stimulator splenocytes and CFSE-labeled BALB/c Thy-1.1 responder spleen and lymph node cells. The division kinetics of the BALB/c lymphocytes in vitro were identical with those of the C57BL/6 spleen and lymph node cells in vivo. 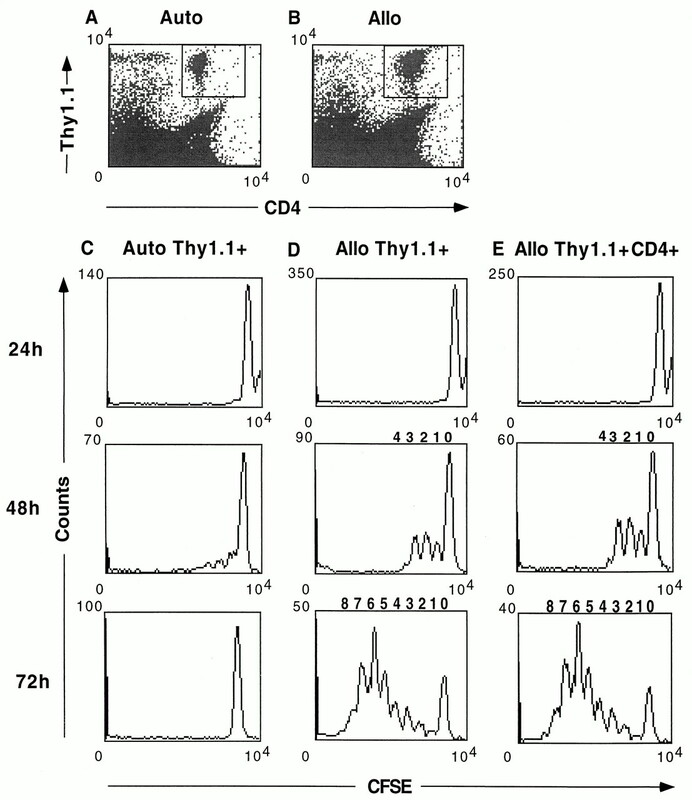 In these experiments, the alloreactive T cell precursor frequency was calculated using a yield-independent approach similar to that described in method 2 above. This is the valid method because the starting number of potentially alloreactive responder cells in each experiment is known (2.5 × 106), and the proliferative history of all allogeneic precursor cells, including cells that have died (16), is visualized by the CFSE-fluorescent profile of the daughter cells generated by the time of harvest from their reaction wells (72 h). In this in vitro system, the frequency of BALB/c (H-2d) splenocytes and lymph node cells reacting to B6 (H-2b) stimulator cells was 4.61 ± 2.22% for all T cells (n = 6) and 1.82 ± 0.95% for CD4 T cells (n = 4). These results are similar to those calculated for the adoptive transfer experiments using method 3. Based on our earlier findings showing that when splenocytes are stimulated in vitro with anti-CD3 and anti-CD28 (16), and when mice adoptively transferred with DO11.10 T cells that bear a transgenic TCR specific to OVA peptide are immunized (17), not all T cells proliferate, we reasoned that in this system all alloreactive T cells might not divide. In the DO11.10 system, the Ag-specific transgenic T cells can be identified using an anti-clonotypic Ab, but no such marker exists to distinguish heterogeneous alloantigen-specific T cells. However, because we demonstrated that nearly 100% of mitogen-stimulated splenocytes in vitro and clonotype-positive cells recovered from immunized mice express the surface markers of activation CD25 or CD69, we reasoned that adoptively transferred allogeneic T cells that bind alloantigen can be distinguished by their expression of surface markers of activation or differentiation. To this end, we examined the expression of CD44, CD45RB, CD62L, and CD69. Naive T cells express on their surface a low density of CD44 and a high density of CD45RB and CD62L, and after encountering Ag, a CD44highCD45RBlowCD62Llow phenotype is associated with T cell effector function (19, 20). We tracked the expression of CD44, CD45RB, and CD62L on individual adoptively transferred allogeneic T cells at 72 h. At the single-cell level, the expression of these differentiation markers was associated with cell division in a manner identical with that seen with adoptively transferred TCR-transgenic T cells (17, 21). CD44 was up-regulated after a single round of cell division and remained elevated throughout the eight mitoses visualized by CFSE (Fig. 3⇓), CD45RB expression decreased 2-fold with each division, and the surface expression of CD62L was down-modulated by division cycles 7 and 8 after undergoing a triphasic expression response during eight rounds of cell division (data not shown). Surface expression of CD69 and CD44 on alloreactive T cells in vivo. CFSE-labeled C57BL/6 Thy-1.1 splenocytes and lymph node cells were adoptively transferred to allogeneic B6D2F1 Thy-1.2 recipients that were sacrificed after 24, 48, or 72 h. Donor cells were recovered from recipient spleen and lymph nodes. 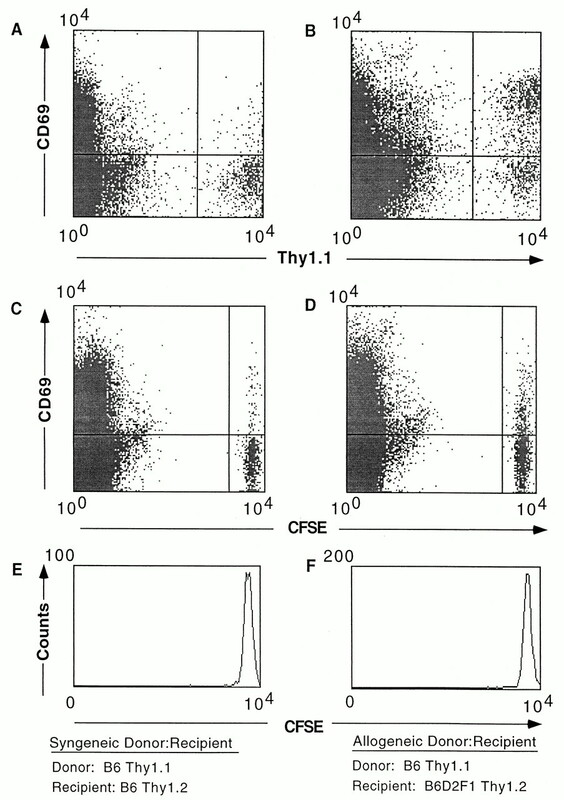 A, Flow cytometry dot plots gated on live Thy-1.1 cells depicting surface expression of CD69 are shown. The insets depict CFSE-labeled C57BL/6 Thy-1.1 splenocytes and lymph node cells adoptively transferred into syngeneic B6 Thy-1.2 hosts. The surface expression of CD69 at time 0, before adoptive transfer, was identical with that depicted in the control at the three time points shown. Surface expression of CD69 (B) and CD44 (C) compared with CFSE fluorescent intensity at 24, 48, and 72 h of live Thy-1.1 CD4-positive donor cells recovered from B6D2F1 Thy-1.2 recipients or syngeneic B6 Thy-1.2 hosts (insets) is shown. The surface expression of CD44 at time 0, before adoptive transfer, was identical with that shown for the control at 24 h. The surface expression as a function of division cycle at 48 h (D) and 72 h (E) of CD69 (○) and CD44 (□) expressed as relative mean fluorescence intensity (MFI) in arbitrary units and the percentage of cells positive for CD69 (♦) and CD44 (▵) are shown. The results are representative of three separate experiments. Because CD44 was up-regulated with cell division, we first focused on this Ag to attempt to distinguish alloactivated cells in vivo. 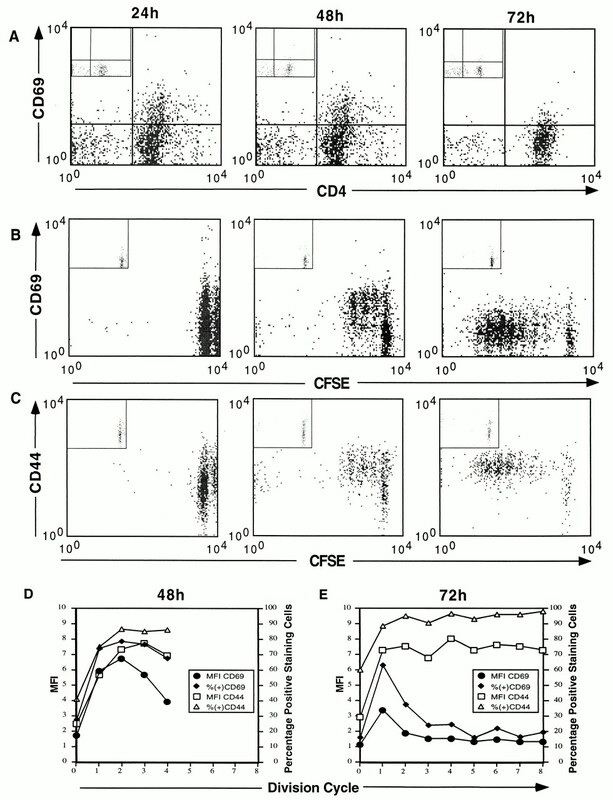 Although essentially all dividing donor cells expressed high levels of CD44 at 48 and 72 h (Fig. 3⇑, C, D, and E), before adoptive transfer, a subpopulation of donor T cells already expressed high levels of CD44 (data not shown), indicating the presence of activated or memory T cells raised to environmental Ags. Following adoptive transfer, but before cell division began (24 h), this subpopulation of CD44-expressing donor T cells remained detectable in both allogeneic and syngeneic settings (Fig. 3⇑C). Thus, CD44 expression cannot be used to distinguish alloreactive cells from nonalloreactive memory cells in this model. We therefore next investigated whether the early activation marker CD69 could be used to identify alloreactive T cells. By 24 h after adoptive transfer to an allogeneic recipient, the expression of CD69 on donor T cells in bulk was elevated, and it remained elevated at 48 h before returning to baseline levels by 72 h (Fig. 3⇑, A and B). By 48 h, ∼60% of CD4 T cells were CD69 positive by division cycle 2, corresponding to maximal expression, following which it began to diminish (Fig. 3⇑, D and E). These data indicate that even after extensive reaction time, elevated CD69 expression distinguishes alloreactive cells early in their proliferative history. However, in contrast to CD44, the surface expression of CD69 by B6 Thy-1.1 donor T cells in syngeneic hosts was low at all time points examined (Fig. 3⇑A, insets). Therefore, although CD69 expression varies with reaction time in bulk and with cell division at the single cell level, its elevated expression in the allogeneic donor T cells, and not the syngeneic controls, reliably distinguishes alloreactive T cells independently of their proliferation. Based on the preceding observation that CD69 expression identifies Ag-activated allogeneic T cells, we next investigated whether the surface expression of CD69 48 h after adoptive transfer can be used to quantify alloreactive T cells in vivo. As seen in Fig. 4⇓, regions can be defined in a flow cytometry plot indicating daughter cells resulting from precursors that were activated and divided (Pdiv), donor cells that were activated but did not divide (Pact), and donor cells that did not become activated and did not divide (Pnil). Using this analysis, 44.60 ± 3.21% of total and 43.50 ± 2.44% of CD4 T cells that were activated by allogeneic stimulation in vivo failed to proliferate (Pact/(Pact + Pnil)). Interestingly, these results were consistent with our previous findings that roughly 40% of adoptively transferred TCR-transgenic T cells failed to divide in an immunized host (16, 17). Adjusting the results of the alloreactive T cell frequency determined by method 3, the most accurate method described, to account for this nonproliferative activated pool yielded alloreactive T cell frequencies of roughly 12.4% and 10.1% for total and CD4 T cells, respectively. 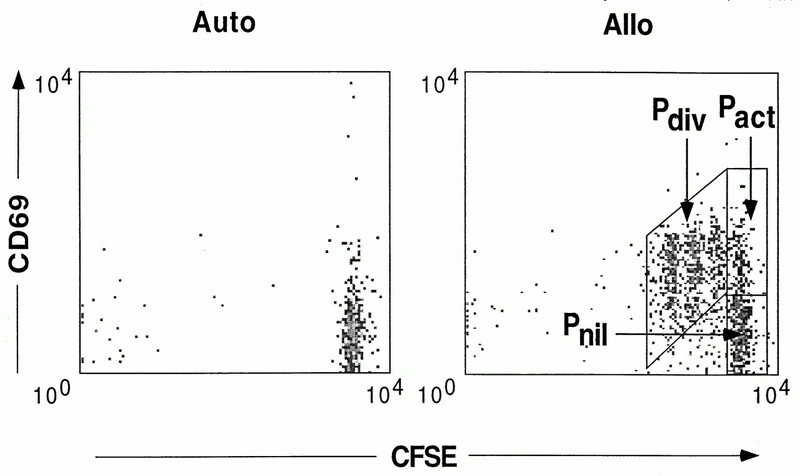 CD69 expression of alloreactive donor T cells at 48 h. Flow cytometry dot plot showing live C57BL/6 Thy-1.1 donor cells recovered from C57BL/6 Thy-1.2 (left, autologous control) or B6D2F1 recipient (right, allogeneic reaction) splenocytes and lymph node cells 48 h after adoptive transfer. Pdiv, Daughter cells resulting from precursors that were activated and divided. Pact, Donor cells that were activated but did not divide. Pnil, Donor cells that did not become activated and did not divide. The number of precursors that divided to generate Pdiv is extrapolated as described in Results. The total number of potentially alloreactive T cells (Ptot) equals Pdiv + Pact + Pnil. The alloreactive and divided T cell frequency equals Pdiv/(Pdiv + Pact + Pnil), or simply Pdiv/Ptot. The alloreactive undivided T cell frequency equals Pact/Ptot. The fraction of alloactivated cells that divide is Pdiv/(Pdiv + Pact), while the fraction of alloactivated cells that do not divide is Pact/(Pdiv + Pact). This plot is representative of three separate experiments. Finally, we investigated whether nonalloreactive cells expressed CD69 and/or proliferated in response to cytokines secreted by alloreactive neighbors or by direct contact with them, so-called bystander activation. CFSE-labeled syngeneic bystander B6D2F1 splenocytes and lymph node cells were coadoptively transferred with unlabeled C57BL/6 Thy-1.1 allogeneic donor splenocytes and lymph node cells into a B6D2F1 mouse. In control experiments, CFSE-labeled bystander B6 splenocytes and lymph node cells were coadoptively transferred with unlabeled C57BL/6 Thy-1.1 splenocytes and lymph node cells into a B6 Thy-1.2 mouse. As expected, there was no proliferation of donor cells in the autologous transfer (Fig. 5⇓A), but considerable activation of the Thy-1.1+ donors in the allogeneic transfer (Fig. 5⇓B). At 48 h, there was negligible up-regulation of CD69 by the bystander cells in the autologous adoptive transfer (Fig. 5⇓C) and only 9.40 ± 4.67% of the bystanders expressed CD69 (Fig. 5⇓D) in the allogeneic transfer. The expression of CD69 by bystander T cells in the allogeneic reaction was ∼10-fold less intense than the CD69 expression by the allogeneic donor cells. Importantly, in neither the syngeneic nor the allogeneic transfer did the CFSE-labeled bystanders proliferate (Fig. 5⇓, E and F), despite induction of CD69 expression in the latter instance. Alloreactive bystander T cell activation at 48 h in vivo. In all experiments, bystander cells are syngeneic to the recipient. A, C, and E, Control condition in which CFSE-labeled B6 Thy-1.2 splenocytes and lymph node cells (bystander) were coadoptively transferred with unlabeled B6 Thy-1.1 splenocytes and lymph node cells (donor) into a B6 Thy-1.2 recipient. Here, there is no allogeneic reaction occurring in vivo to stimulate a bystander response. B, D, and F, Experimental condition in which CFSE-labeled B6D2F1 (Thy-1.2) splenocytes and lymph node cells (bystander) were coadoptively transferred with unlabeled B6 Thy-1.1 splenocytes and lymph node cells (donor) into a B6D2F1 recipient mouse. After 48 h, the spleen and lymph nodes were harvested from the recipients, and flow cytometry was performed. Upper panels (A and B) show CD69 and Thy-1.1 expression. 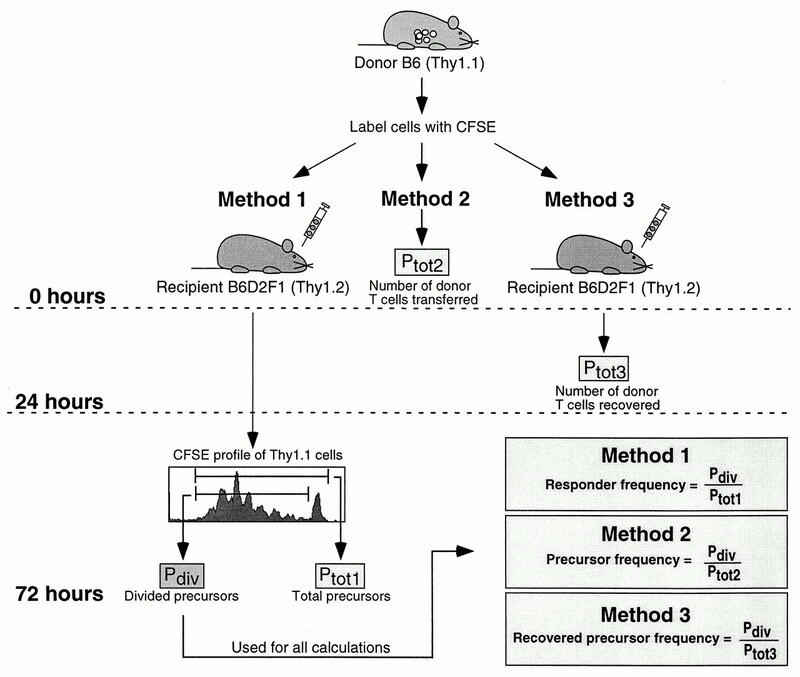 Middle panels (C and D) are gated on live Thy-1.2 cells (recipient and bystander). The CFSE-positive cells are the bystanders. The bottom panels (E and F) show the CFSE division profile of the bystander population (live Thy-1.2 CFSE+). No division is seen in either the syngeneic control (E) or allogeneic system (F). Results are representative of two separate experiments. In this study, we set out to examine lymphocytes reacting to alloantigens in vivo by transferring CFSE-labeled parental donor splenocytes and lymph node cells into an F1 hybrid recipient. Because the donor cells were unfractionated splenocytes and lymph node cells, APCs were transferred to the recipient allowing for indirect allorecognition. In turn, because the recipients were not irradiated, their immune system can present donor MHC via the direct pathway. Therefore, the responses quantified in these experiments involving major and minor alloantigen mismatches should represent the combined effects of both pathways of alloantigen presentation, although it is likely that the majority of the response is through direct allorecognition (22). The in vivo alloreactive T cell frequency was calculated by three different methods based on donor T cell recovery. In method 1, the precursor T cells that divided at 72 h are a fraction of the total donor precursor cells analyzed, yielding results that agree with studies examining splenocytes transferred to an irradiated allogeneic host (22), but are higher than most historical estimates of the alloreactive T cell frequency. The alloreactive response measured by method 1 most likely overrepresents proliferative donors because donor cells that do not find a niche, or do not divide, will have died by 72 h, and consequently are not analyzed. This analysis is useful for in vitro studies examining T cell responses to mitogen, in which all of the cells are potentially reactive, and all are recoverable at the time of analysis (16). In method 2, we quantified alloreactivity at the opposite extreme, before donor cell proliferation occurred. The result is likely to be a low estimate of alloreactivity because recovery of donor cells from the recipient lymphoid organs is limited by cell death and by there being only a small number of transferred cells that may be circulating or residing in nonlymphoid organs at the time of analysis. Method 2 does, however, consider that the total potential donor T cell pool is larger than, and possibly biologically different from, its portion recovered from a recipient at 72 h, as done in method 1. As a solution, method 3 expresses the maximal T cell proliferative response as a fraction of donor T cells that had engrafted in the recipient lymphoid organs, but had not begun to proliferate. By considering the extent of lymphoid engraftment, we believe the recovered precursor frequency measured by method 3 is the most biologically valid of the methods described. Indeed, the results obtained by this method are in close agreement with our in vitro MLR results, in which the alloreactive T cell precursor frequency is calculated based on a known number of potentially alloreactive T cells, all of which are recoverable at the time of analysis. The assumptions of this yield-independent calculation for the MLR are the same in method 3, in which the cells that proliferate in vivo are expressed as a fraction of the donor T cells that have homed to the lymphoid organs, where they are situated for alloantigen presentation. We recognize a number of caveats to method 3. First, the observed alloresponse might not represent all donor T cells if alloreactive donor cells that engraft nonlymphoid organs behave differently from cells that populate the spleen and lymph nodes. By limiting analysis to the lymphoid organs, however, the maximal alloresponse is quantified. Second, the donor cells that do establish in the recipient lymphoid organs might not be representative of the total donor peripheral T cell population. However, we demonstrated with the alloantigen-specific bm12 model that the donor cells that home to the recipient secondary lymphoid tissues are quantitatively representative of all donor cells, and are not preferentially sequestered at these sites. Additionally, the established cells are similar in phenotype to the transferred cells, as the CD4 to CD8 ratio of the B6 donor cells recovered from B6D2F1 recipients at 24 h (2.10 ± 0.29) was comparable with that of injected donor cells (1.67 ± 0.12). Finally, donor cell death between 0 and 24 h might lead to a high estimate of the frequency of alloreactive T cells due to overrepresenting proliferative survivors. To address this, we are currently attempting to quantify and track the proliferative behavior of dead or dying adoptively transferred allogeneic T cells in vivo. The in vivo alloreactive T cell precursor pool size can vary with the model used for its measurement. Whether or not the host is irradiated may affect the derived numbers. For example, in a parent→F1 model, such as was used in this study, the intact host immune environment affords physiological conditions for histocompatibility Ag presentation and costimulation of donor lymphocytes by recipient APCs. Alternatively, in a model in which the host is irradiated, the ablated immune compartment of the recipient may be less likely to provide physiologic conditions for direct alloantigen presentation or the delivery of costimulatory signals. Moreover, any alloantigen-specific donor cell proliferation in an irradiated host could be obscured by the nonspecific homeostatic proliferation that occurs when a limited number of T cells are transferred into immuno-incompetent mice (23, 24, 25). In the model used in this study, there is no homeostatic proliferation, so the measured pool size reflects only alloantigen-specific responses. The irradiated recipient model may be appropriate for studies designed to mimic the clinical situation of bone marrow transplantation, whereas the parent→F1 model may be better suited to studies of clinical solid organ transplantation, in which the alloimmune response occurs in the context of a normal immune compartment. The in vivo alloantigen-specific proliferation demonstrated marked heterogeneity in the number of rounds of division the precursor cells underwent by 72 h. How many times an alloreactive T cell divides may influence cell differentiation and effector function, as has been demonstrated in TCR-transgenic T cells responding to nominal Ag in vitro (26) and in vivo (17). This heterogeneity also suggests that the allogeneic response in vivo may consist of some T cells that proliferate, some that are anergic, and some that are deleted or die. The techniques described in this study would enable quantification of proliferating and nonproliferating cells under specific immunotherapeutic interventions to determine the relative contribution of these T cell responses. Furthermore, isolation and purification of these distinct subsets are possible for functional and biochemical characterization. We found a substantial number of alloactivated cells did not divide by 48 h. This group, which comprised almost half of the donor cells that expressed CD69, would not be detected by any of the three quantitative methods described, as it is nonproliferative at the time of analysis. Interestingly, the fraction of alloactivated T cells that actually divided equaled 50–60%, a value similar to our previous findings quantifying the frequency of proliferating splenic T cells stimulated with mitogen or adoptively transferred TCR-transgenic T cells in an immunized host (16, 17). This suggests that even in the vigorous in vivo polyclonal response to alloantigen, individual T cell proliferation is stringently regulated by an intracellular checkpoint downstream from TCR ligation, and CD69 expression, that limits the total proliferative response. This system allows the direct measurement of bystander activation, a problematic factor in previous attempts to determine the alloreactive precursor frequency. The supernatant of a primary MLR was shown to induce the proliferation, measured by 3[H]thymidine incorporation, of naive cells equivalent to the primary response itself (15). In contrast, bystander phenomena has been shown to lead to activation-induced cell death, in nonalloreactive donors (27). In our in vivo system, by 48 h no syngeneic transferred bystanders had proliferated, and only 9.40 ± 4.67% expressed the early activation marker CD69, while the alloreactive donor cells had up-regulated CD69 to a greater extent and demonstrated considerable proliferation. These data suggest that bystander activity is negligible in allogeneic proliferative responses occurring in vivo. Accurately quantifying allogeneic responses is important to investigations of peripheral tolerance induction to alloantigen. In a haplotype mismatch cardiac allograft model, recipients treated with agents to block costimulatory signals and rapamycin alone or in combination led to a reduction in alloreactive T cell clonal size through apoptosis. However, cyclosporin A in combination with costimulatory blockade abolished T cell proliferation, apoptosis, and tolerance induction (28, 29). Future clinical strategies to induce transplant tolerance may therefore rely on quantifying the alloreactive T cell pool size that may be eliminated as well as the pool size of alloreactive cells that may be immunoregulatory and therefore lead to enduring tolerance in the absence of ongoing pharmacological intervention. We thank T. Judge, H. Gudmundsdottir, and M. Walsh for helpful discussion and technical advice. ↵1 This work was supported in part by National Institutes of Health Grants A137691, A143620, A141521, and 1KO1DK02771-01. L.A.T. is an Established Investigator of the American Heart Association. E.J.S. is supported by a research fellowship from the National Kidney Foundation and the American Society of Transplantation. ↵2 A.D.W. and L.A.T. are co-senior authors. ↵4 Abbreviations used in this paper: LDA, limiting dilution analysis; ELISPOT, enzyme-linked immunospot.